Sometimes you have to move away from the forest to see the trees. This is the way it is for me. When I travel to sacred sites, sometimes the hoards of bustling tourists and the abundance of the sights, smells, and sounds overwhelms the senses and shrouds the truth. Sometimes I catch glimpses of the truth in sites that tourists have not discovered, or where the trek is too difficult for them to make. Sites like Mooray, the Moon Temple behind Machu Picchu, and the top of Taquile Island, where Lord Meru's Universal Temple of the Heart resides, have a gentle privacy. In these quiet small sites, I am able to catch glimpses of the truth of who you and I really are. This truth isn't about who we've been, or who we are now, or who we will be in the future. It is not about defining our egos or personalities. It is about a core truth about who we ALL are and why we are attracted to temple sites built by the ancient ones . . . the Star Elders. During this recent trip to Peru, a realization has settled into me. For the last 10 years, I have kept returning to the Andes in hopes of remembering or realizing something I knew I forgot. I was not willing to settle for less. 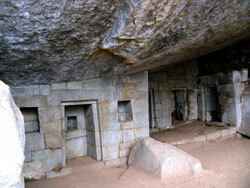 I was not willing to settle for remembering who I was or what I did in a past life while living in the Andes. I was unwilling to settle for remembering how we lived back in those days of light. There was something else I was digging for. Something else I was trying to remember. I was asking for the next step. I was asking to realize a new way. Now after 10 years, I feel that I've begun to ignite this memory within my soul. This memory fills me with a sense of peace and light that is so familiar. It feeds me in places that I've never been fed. It fills me in places that I've always felt empty. It has allowed me to reach into the depths of my soul. The memory that is ignited in me isn't wisdom of the mind, but more of a feeling . . . an experience of myself that I'm having. The quality of my visions changed dramatically during this year's pilgrimage to Peru. At first, it was hard to understand what I was seeing, because what I was seeing was so new. 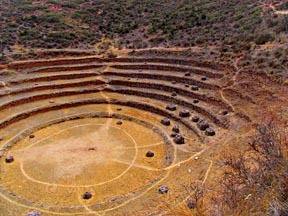 I received the first part of the vision while I was in Mooray in the sacred valley of the Masters. 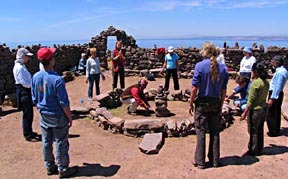 Our group had settled in for a meditation/ceremony inside one of the ancient concentric circles. Within a few minutes, I was aware of a huge spirit that was hovering above us. At first, all I could see were huge loving eyes watching over us. Then I was able to see the entire face of the spirit. This being was Jeshua. Jeshua began to send us a shower of sparkling, crystal fire light rain. These tiny droplets began to infiltrate every cell of our bodies. He said that these bits of crystal fire light would ignite the fire of God within each of us. Soon after, our group was visited by thousands upon thousands of spirits flooding into the circle. 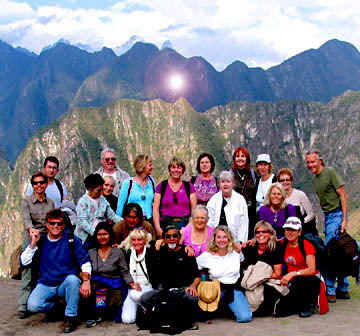 They became a legion of light that was to walk with us the remainder of our pilgrimage in Peru. The second installment of the vision came many days later when a few of our group hiked down to the Moon Temple behind Machu Picchu. We got up early and took the very first bus up to the site. We hiked quickly to the back gate, where one has to sign a log to climb Waynupicchu or hike to the Moon Temple. It was a 1 1/2 hour hike down to the Moon Temple. We were the first to arrive and had the place to ourselves. I was hoping I would get a message from the grandmother spirit who resides there. She had been quite verbal in years past. I sat for a while in the back of the cave feeling a little put out that she wasn't talking to me. Pretty soon I got the message that she wanted me to build a fire. "Oh yeah right", I thought, as I noticed everything around me was damp. How unlikely was it to build a fire here. (read another fire story ... The Maya Cosmo-Vision - Entering the Fire http://www.alunajoy.com/98may.html) I said to the few around me, it looks like grandmother wants us to build a fire for her. I don't like arguing with grandmother, so we all began to scramble around for bits of wood and partially dried grass to start a small fire in the back of the cave. It took us a long time. The grass would begin to burn, and then it would go out. The wood wouldn't catch either. Everything was damp. We kept blowing and blowing on the embers, and at times, we wanted to give up. Our fingers were getting burned by the over heated lighter that we had. After about 20 minutes of what seemed like a futile attempt at building a fire, the grass dried out and began to take hold. Then the wood caught fire also. Soon, no matter how hard we blew on the fire, we couldn't blow the flames out. It had a life of its own. Grandmother said the message IS the fire. She said the fire is like our God Self. Our God Self is like the fire we just began. It takes a long time and a lot of effort to begin the fire of God within our spirits deep in your soul. But once it begins to take hold, nothing . . . nothing can put it out. She said that many times we give up just before the fire bursts alive in our soul. We give up because we think it is not working. Sometimes we give up because we doubt that it's even a possibility at all to awaken the light of God within. Her message was not to give up. Keep on keeping on. You're a gold mine. 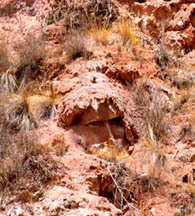 Did you know that, hidden in the dirt of the earth? As the last flame disappeared into smoke, I picked up the bowl of water and noticed little bubbles that formed in the bottom of the bowl. This tells me that the energy had indeed entered the water. Then I poured the water into a cobalt blue bottle that I had brought with me. The minerals that create the blue bottle also protect the essence from altering once it has been made. Each of the group members took a sip of the remaining water in the bowl. We were all surprised as to how much energy we could actually feel entering our bodies. Zingie for sure . . . Grandmother said that now any one who drank this essence would feel the crystal fire light energy activating the light of God within. The third installment of the vision came once we arrived at Lake Titicaca. At this point, some negative energy began to disjoint the group. This is a common problem in groups. Once you build an incredible amount of light within a group, balancing forces come to test the group. It can really make or break a group. We had a group meeting to synchronize our energies, and deepen our heart connection with each other and the lands that we were in. At this time, we saw a very organic matrix of light tying us all together, binding the group's hearts, yet honoring all our diversities. We represented Christians, Hindus, Jews, and many other belief systems throughout our group, yet we were all heart family. I was told this matrix of light between us was not only to bind our hearts together as family, but also to join us together with a stronger light, so that when we returned home, we could anchor that light in our own homelands. Truth never argues with individual beliefs. Truth transcends culture, race, religion, social status, age and educational level. Whatever negative energy was attracted to us had been cleared out. We had passed the test. The next morning we hopped a slow boat for a two-hour ride to Taquile Island. I call Taquile Island the Heart Island. But this time I would understand the deeper reason why this was true. Not only do the people of Taquile live an extremely simple and peaceful life, but the island itself sits very near an inner dimensional city of light and the hiding place of the great Solar Disk of the Inca Masters. I find that spending time on this island activates the heart profoundly, but only if you're ready for this activation. If you're not ready for the heart opening, you may not feel the powerful presence here, or hit a lot of major issues. We spent most of the first day and night, just letting the energy saturate us. I planned this on purpose because the next morning, I asked the group to join me at the top of the mountain, where Lord Meru's Universal Temple of the Heart resides. At the top of this island, very little of the original temple remains. In fact, to the untrained eye or heart, most would not recognize what this place is. It was here where I received the last installment of the vision. This last installment made all the other pieces I had received, to this point, fall into place. First, we did a bit of work in the temple, re-stacking stone and cleaning it up. This was giving the physical area some respect for holding the energy for us. Then we circled up and began our meditation/ceremony. The energy was quite intense. I began to see the awakening fire of God within each of us go into the matrix that connected all of us, and with everyone's permission in the circle, from our hearts with much love, we sent this energy down into the earth. Just beneath the temple, I saw a tunnel in which this energy descended into. Here it connected to the matrixes that connected each of us together, all the sites in Peru, and to the entire planet. It was clear we were doing this so all beings of Earth could benefit from what us few simple and humble people experienced in the Andes from Jeshua and the other ascended Masters. The energy is now pulsing across the planet, igniting the flame of God within each and every open-heart. I sat on the site until every single person had left. I wanted to say my goodbyes privately, as this is the last sacred site we would visit on this journey. Lord Meru told me two things that added some clarity to the visions that I had had. First, Lord Meru said, you can't pull light into yourself from the outside sources. It only drains the universe, the sacred sites or the person next to you. It is a form of vampirism that most are not aware of. This light can not sustain any one for very long. This kind of external light/energy is like a drug; you will need more and more of it. It is a temporary fire; not an eternal fire. The only sustaining light, energy, power you can activate within yourself is the one that comes from within yourself. It is the little tiny crystal like flames that you forgot to blow on to make a blazing fire that no one can put out. These are the tiny little drops of fire that Jeshua reminded us of when we were in Mooray. Second, Lord Meru said, once you have ignited the God light flame within to the point that it cannot be put out, you cannot keep this fire for yourself. You must give it all away. By giving it away, the fire actually grows brighter within you. In this world, we are taught to hold on to things that we have acquired. But here the truth is the opposite. You cannot keep the fire, the light inside of you, for these selfish reasons. You cannot keep this flame inside you because you fear lack, or out of ego you need to feel special. If you hold on to the light within, you will snuff out that fire by your own control. The fire will burn so strong that you cannot put it out, but you cannot hold on to it either. By giving it away, you receive even more. By holding on, you lose everything. "If you could get rid of yourself just once, the secret of secrets will open to you. The face of the unknown, hidden beyond the universe, would appear on the mirror of your perception." Lord Meru said the world is full of people who present themselves outwardly to be special or say that they have special abilities due to their hard spiritual work. But on the inside, they are always struggling for more, needing more light, more energy from the universe, from sacred sites, and from other people. They feel the power and light outwardly, but have forgotten that they have it inside. I guess the bottom line here is something that we've always known, but we now understand it on a deeper level. The light of God is within. It always has been. There is no reason to reach outside ourselves to ignite this flame. Sacred sites of the earth, anchored by masters of light, do not need our activation. The portals of light have never been closed no matter how degraded the original physical temple has become. Nor can we gain any sustaining energy from sacred sites. What they do offer us is a millennia of the etheric record of those who have walked this path before us . . . our brothers and sisters, just like us, searching to awaken the God self inside themselves. Their inspiration and encouragement still resides in sacred sites around the world. Spirit wisdom trapped in stone. They are our way showers. We will be the way showers for those who walk the path after us. It is up to us to leave a strong and lighted, inspirational path. LAST NOTE . . . After I wrote this, during my first venture out into the world, I bumped into a friend named Walker. She said that my story was like a song that she knew from Peter Gabriel called "Biko". Some of the lyrics go like this . . . You can blow out a candle, but you can't blow out a fire Once the flames begin to catch, The wind will blow it higher ... And the eyes of the world are watching now . . . watching now. the winds, the tides, and gravity we shall harness the energies of Love. Then for the second time in history of the world we will have discovered fire. IT IS SO WONDERFUL to be with FAMILY! Hello, I just read your letter about Awakening Elemental Consciousness sent to me in the Awakening Path letter. I feel very deeply affected by the information you share and am adding my comitment to the rest and maintain the positive projection and imagine it in all the darker places. I do have on question though, who is the one negative being left standing? Sincerely, Luana Aluna answers... SIMPLE ... The last one with a negative thought.